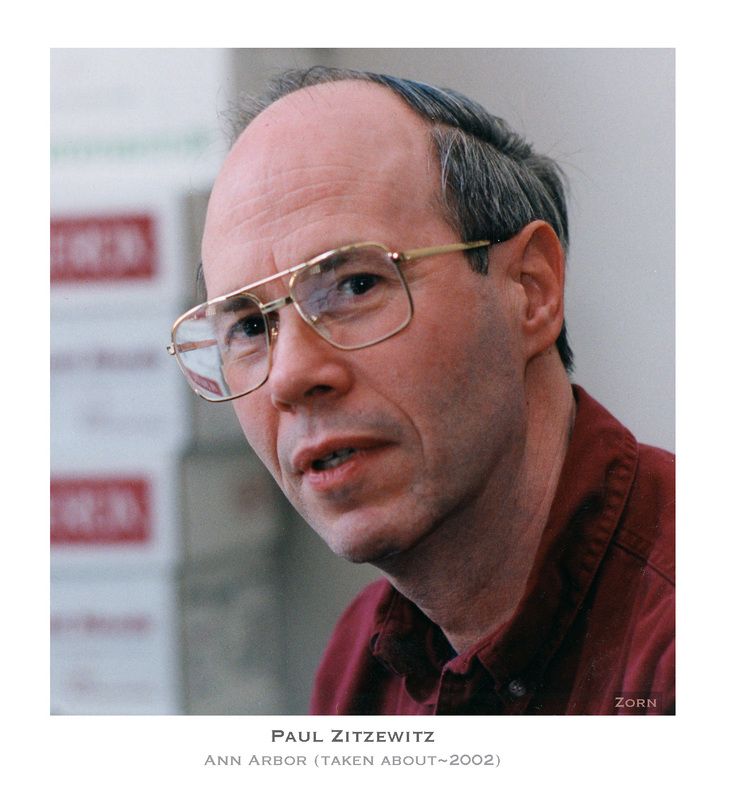 Paul Zitzewitz, who contributed so strongly to our research enterprise, had many colleagues on the Ann Arbor campus. Four of those colleagues are with us today, and each of them could be speaking in my stead: David Gidley, the leader of the positron group; Ralph Conti of General Dynamics; Bita Ghaffari of the Ford Motor Company, and Rich Vallery, chair of physics at Grand Valley State University . I also speak on behalf of dozens of Paul’s colleagues in atomic physics, a group whose members enjoy an unusual sense of community because so many of them can trace their scientific genealogy to a very few primary branches on the “Rabi Tree”. That tree (which has 20 Nobel laureates on its branches) shows that Paul and I are scientific cousins since our thesis directors (Norman Ramsey at Harvard and Vernon Hughes at Yale) had both been students of I.I. Rabi at Columbia. Another scientific cousin with us today, who could well be speaking in commemoration of Paul, is Robert Hilborn, a fellow Ramsey graduate student who is now, after a distinguished university career, Executive Officer of the American Association of Physics Teachers. Paul graduated from Carleton in 1964 and entered the graduate program at Harvard. He soon joined Norman Ramsey’s group, arguably then the best atomic experimentalists in the world with many of its graduates already in careers of unusual distinction in academia, industry, and government. I know from personal experience that it is not easy to make the transition from being the top student in a small college, confident in one’s grasp of physics, to being a first year student in a hypercompetitive graduate school. (I see Bob Hilborn smiling in knowing assent). You often face the larger reality that a fundamental understanding of some topics may be beyond your talents, mastery not coming no matter how hard you try. Your discouragement is amplified if there are others in the class who seem to master the topic with ease. At this point you must stop obsessing over not being able to understand everything and, instead, focus on what you can do well. You need to find a thesis advisor who will help match a research topic to your theoretical insights and your experimental talents. Paul was an outstanding example of putting effort into those things that he could do best. Ramsey, as one of the most influential physicists of the 20th century, was frequently away from Harvard. He did set the general direction of the laboratory’s research, he aided in choice of thesis topics, and he did engage with critical issues when time permitted. But the students in Ramsey’s group were largely responsible for working out the day-to-day problems of their own research, often by consulting other students and postdoctoral fellows. Paul rose to the challenge presented by that research situation. His doctoral dissertation was on minimizing systematic errors that affected the frequency of the hydrogen maser, this with the intent of developing an atomic clock to be used as a precise standard of time. Metaphorically, we can regard oscillations within a hydrogen atom as the pendulum for the clock. But motions of that pendulum were perturbed whenever the hydrogen atom bounced from the walls of its container. Paul’s achievement was to design those walls so that the pendulum suffered only minimal perturbation as the atom underwent many wall collisions. Paul’s research provided a foundation on which others (e.g. Tom English, a Michigan PhD and a postdoc with Ramsey) built the atomic clocks now used on GPS satellites. Paul finished his work at Harvard in1970, a time when the Mansfield amendment had drastically reduced the federal funding of academic research. Universities had cut back sharply on the hiring of new faculty and the job market for physics PhD’s shifted more to industry. In this harsh employment climate, Paul was able to obtain a postdoctoral fellowship at the University of Western Ontario and then move to a research position at the Corning Glass Works. Yet Paul’s drive for an academic career persisted. His talent and accomplishments led to an assistant professorship at the Dearborn Campus of the University of Michigan, the 1973 start of the enormously successful academic career which Don Bord has so eloquently described. After getting started at UM Dearborn, Paul’s drive to do fundamental research led to his collaboration with Arthur Rich’s large and well-funded group that was doing research on positrons on the Ann Arbor campus. That collaboration started in the mid-1970s with studies of the interaction of positrons with surfaces and with the making of low energy, focused beams of positrons. This opened several new areas of inquiry: for example the availability of spin-polarized positron beams made it possible to search for the origin of the preference for left-handed twists in the molecules associated with life. Paul also made major contributions to the group’s extensive research on the lifetime of the positronium atom. Gidley’s early (1976) work had shown that earlier measurements of this critical quantity were probably in error. Measurements of this lifetime formed a major portion of the group’s research effort until Vallery, Zitzewitz and Gidley published the definitive result in 2003. Paul’s understandings have contributed immeasurably to other positron-related work, for example the APS award-winning work on chaotic transport in charged particle traps done by Bita Ghaffari, Ralph Conti and Tom Steiger. Paul also contributed to the Positron Annihilation Lifetime Spectroscopy (PALS) for measuring nanoscale defects and open volumes being done by Dave Gidley and his students. Paul is a coauthor of more than twenty positron-related papers, a half-dozen of which are in Physical Review Letters. Not to be overlooked is that he was also the main conduit for news about innovations in physics education to the Ann Arbor department. Paul was a long-term, valued member of the Ann Arbor positron group who did much for group morale. Arthur Rich was a gifted physicist who demanded much from his students and we were fortunate that Paul, being a first-class researcher in his own right, was uniquely positioned to make friendly interventions when discussions became too intense. Moreover, Paul was very helpful when Dave Gidley assumed leadership of the group after Rich’s unexpected, untimely death in 1990. It is remarkable that Paul maintained an extended, fruitful collaboration with Ann Arbor, 25 miles away from his home base in Dearborn where he was, concurrently and for extended periods, carrying heavy responsibilities for teaching and administration, contributing to texts and outreach for K-12 teaching, and devoting time as an officer of the American Association of Physics Teachers. We must also recognize Paul’s and Barbara’s generosity in endowing both local and national fellowships for study in physics. Paul had an extraordinary gift for bringing out the best in others. as mentor, and as a friend for more than 35 years. all that she did to make that possible. In the mid-1970s Paul had started to come out to Ann Arbor to work with Art Rich’s g-factor and positron/positronium group. He had the idea that new areas for positron research would open up with the advent of low energy, focused beams of positrons (focused as one would do for electron beams in a cathode ray tube) and I believe that he and Art also thought the beam could be spin polarized as well. Using what looked to us as a surplus, vintage ion pump and working on a shoe-string budget, Paul had made the group’s first “beam” of positrons—the plural here was jokingly optimistic as he struggled to find moderators to convert fast beta decay positrons into focusable low energy positrons. He detected positrons by focusing them onto the 1 cm cone of a channel electron multiplier. The count rate was initially so low that Paul made an “up-down” counter that added counts when the beam was on and then subtracted background with the beam turned off—he was statistically digging the beam out of the multiplier’s background noise while searching for the right tune of the beam lenses. I was minding my own business as I began my thesis experiment to measure the decay rate of ortho-Positronium (o-Ps) in some very light fluffy powders of SiO2 and MgO. The results (1976 PRL) were startling as we deduced an o-Ps decay rate, extrapolated to a vacuum environment, that was some 2% less than the two 0.1% measurements (at Yale and at University College London) that extrapolated over gas density. Moreover the existing theoretical calculation agreed with the gas measurements! . The systematic concern with all of these experiments is that you need some material to supply electrons to form the electron-positron (Positronium) bound state but then the subsequent interaction of the Ps with that same material (gas molecules or powder grains) increases the overlap of molecular electrons with the positron in the Ps, and hence increasing the measured decay rate. The trick is to correctly extrapolate the measured decay rates to zero density. Ideally, one wants Ps isolated in vacuum. I’m sure Paul was aware of this clear discrepancy in decay rates as there were always wonderful group discussions in Art’s group but I distinctly remember running down the hall and bursting into Paul’s corner of the lab with the question “Paul, can we put a gamma detector next to your beam to see if you are making Ps in vacuum on the cone of your electron multiplier?” Together we jumped on this so fast that our first paper with Paul was published with the ultra-rare sans review in PRL (Paul, Art, Ken Marko, and Dave) within that same year of 1976. The controversy only deepened as this direct measurement in vacuum nominally agreed with our powder results. At this point we had a tiger by the tail so none of us were letting go—Paul was hooked on decay rate measurements. We had to understand if there is something fundamentally wrong with either the gas measurements or our powder/vacuum results. So we enlisted a longtime positron expert, Derek Paul from the University of Toronto, to work with us on our own gas experiment. In 1978 we published another PRL wherein our extrapolation in gas density is even lower in decay rate than either the powder or vacuum results (not to mention the earlier gas experiments, now almost 3% higher). At the same time we continued to use Paul’s ever-improving beam to improve our vacuum measurement. I still have a Polaroid picture of Paul’s positron rate meter with a note pasted to it exclaiming the unparalleled count rate of 80 per second! With Paul’s help modern positron beams achieve rates of over 108 per second. This improved vacuum measurement was published in Physics Letters, also in 1978. It would be 12 more years before we would again publish a new vacuum measurement, Jeff Nico’s thesis work, also in PRL. In 2003 we published our final PRL on the vacuum measurement as Rich Vallery’s thesis. Paul was intimately involved in these two PhD thesis projects. In that very intense 6 year period Paul and I collaborated on 3 PRL’s, one Physics Letter, and one Nature article. Our publication rate slowed down after that but positron beams came to be the centerpiece of my research career and much of this I owe to Paul Zitzewitz. I became aware what a marvelous and dedicated teacher Paul became and I will let others who knew so well this side of Paul comment on it. But I knew Paul for some 35 years first as a top notch physicist. Paul’s obituary in Physics Today ( April 30, 2013) gives more details of his contributions to teaching. See also the AAPT’s memoriam notice about Paul on the website of the American Association of Physics Teachers.